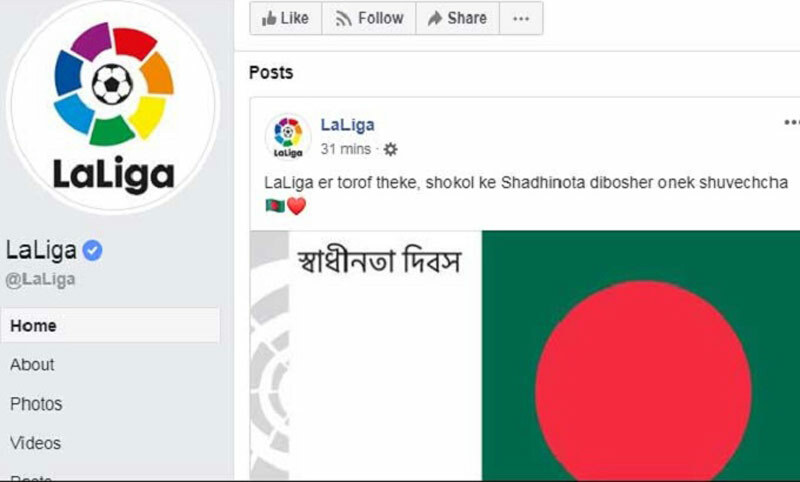 Spain’s premier football league LaLiga on Tuesday posted a picture of Bangladesh flag on their Facebook page with the message "Laliga er torof theke, shokel ke Shadhinota dibosher onek Shuvechcha ". Bangladesh is celebrating its 49th Independence Day Tuesday and Spain's top-flight league took the opportunity to wish its fans with the post. The football fans in Bangladesh are keen followers of the Spanish La Liga, especially its leading clubs Real Madrid and Barcelona.